Click on the book for course descriptions and schedules. IMPORTANT NOTE: Do not worry about the new SAT. About every 10 years the SAT changes (the last major changes occurred in 1996 and 2005). Whenever this happens, students and parents tend to panic, until they realize that the new test isn't harder; it's just different. And students who prepare properly will continue to do well. WHO WILL BE AFFECTED BY THE UPCOMING CHANGES TO THE SAT? 1. Students graduating in 2016 (current seniors) will take only the current version of the SAT. They are not affected at all by the changes to the SAT. 2. Students graduating in 2017 (current juniors) have a choice. 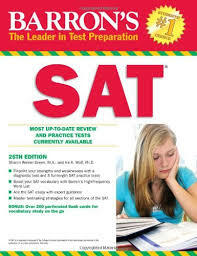 If they choose to begin their preparation early, they can take and retake the current SAT: they can take the SAT for the first time this spring (in March or May); if they want to take the SAT a second time to improve their scores, they can retake it next fall (in October or November), and, if necessary, even a third time (in December or January). If they prefer to wait and take the SAT in their junior year (as most students will do), they will take the NEW SAT, which will be administered for the first time in March 2016. 3. Students graduating in 2018 or later will all take the NEW SAT when the they are juniors.